What a weekend!! We had a tonne of fun with the “big kids” from our church and ended the weekend relaxing with our “little kids” (and there’s a video below of one of our kids). Craig and I spent the weekend with 9 “big kids” from our church’s Senior Youth Group (grades 9-12). It was a lot of fun! We headed to Emerald Lake campground on Friday night. After checking in, the kids got to work setting up their tents and getting organized. We had a late dinner followed by relaxing around the campfire.Saturday was spent at the lake. They had huge, blow up water toys! 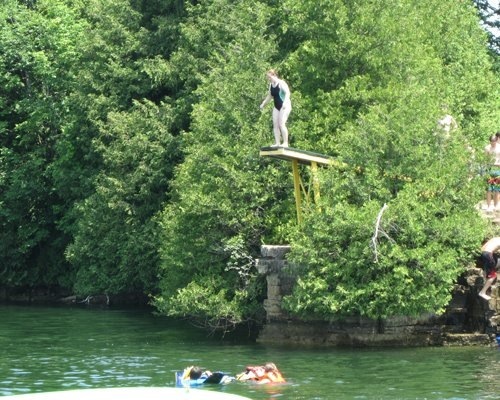 There were trampolines, log rolling, teeter-totter and rock-climing-type thingy (not sure what it was called). The kids spent a lot of time trying to run from the big trampoline to the smaller one across the “moonwalk” to get to the smaller trampoline on the other side. A few kids were successful…but we all had fun trying to get across. We also jumped off the cliff. That was a LOT of fun!! Dinner was late that day with an even later campfire. A few kids stayed up chit chatting around the fire until the wee hours of the morning. After a few hours sleep, we got up and started packing. The sprinkles of rain kept us moving because no one wanted to be stuck outside if it decided to rain harder. After a quick stop at Timmy’s we were on our way home. Craig had taken some of the kids back to Oakville but I head to Niagara Falls to get our “little kids” who were very happy to see me when I got there. Once were were home, unpacked and took the trailer back to the storage stop (we can’t keep in our drive way for the summer anymore because some crazy person in our neighbourhood called by-law and they tried to slap us with some ridiculous fine.Fortunately, our friends down the street were having their Sunday night gathering so we didn’t have to cook! The kids played in the pool and we were able to relax! I did hop in the pool for a bit and helped Rachel learned to dive! We started on one knee and after 3 times doing that, she tried from her feet! Way to go Rachel!!! and come September I will remember our camping days and friendships true. If you didn’t go to summer camp, or maybe specifically Girl Guide camp, you might not know that the title of this blog is a line from a camp song. Linger is one of the songs that we would sing at the end of a campfire, especially on the last campfire of camp. Mm-mm, a little longer here with you. Mm-mm, that this should be my last with you. Mm-mm, our camping days and friendships true. Camp songs hold so many memories for me. We sang them while on a 10-day canoe trip through Temagami or while doing chores on site. Last weekend I spent time with my mom and the girls camping. One night sitting around the campfire, Rachel started singing the songs she learned when we were up at Muskoka Woods for the weekend a few weeks ago. This led into me singing songs that I could remember from when I went to camp. The memories started flooding back… singing “Keep on the Sunny Side” while paddling a canoe through Algonquin park on a 10-day canoe trip. Rachel’s favourite from our Muskoka Woods trip was “The Moose Song“. She and her new friends got to sing it during campfire. It’s nice to know that when she goes to camp this summer she’ll know a few songs but she will learn so many new ones. I’m so excited for her! Rachel is going to get to do a lot of new things at camp this summer…more than just learn new songs. And when she comes home from camp, she’ll have a whole new list of songs to sing, and a lot of memories to go with them. Do you have a favourite camp song? What does it remind you of? 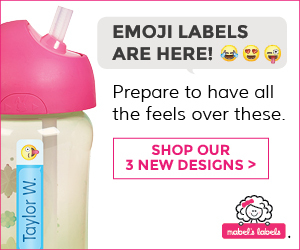 I’m an Our Kids Brand Ambassador because I love Summer Camp! With only one month until the end of school, the race to be ready for camp is on! I’m sure parents everywhere are making lists and checking them twice! It’s amazing how much stuff one little person needs when they go away. Do not bring valuables such as MP3 players, jewellery or cell phones as Muskoka Woods will not accept responsibility for lost or stolen items. That’s easy enough. And I would think that most camps are pretty similar. Sunscreen and a hat would be number one if I was writing the list but I’m fair-skinned and sun isn’t usually my friend. The fact that she wants to bring China pulls at my heartstrings. Everywhere I went, my teddy bear, Knickerbocker, came with me. Every summer camp, every sleepover at friends’ houses, trips to Grandma and Grandpas. He was my best buddy. 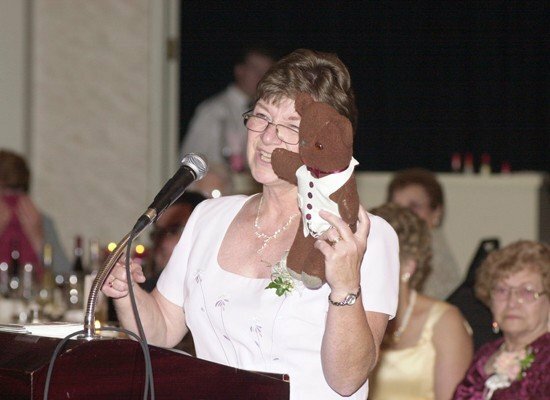 Knowing how much Knickerbocker means to me, my mom even smuggled him into our wedding. So now my little girl is off to camp, and her best buddy is going with her. Guess he’s moving to the top of the list! What items do your kids bring with them to camp? What are your priorities when preparing for camp? My daughter is going to summer camp! Is she ready? Am I? Summer break for the kids is less 2 months away!! For us this means weekend camping trips almost every weekend. 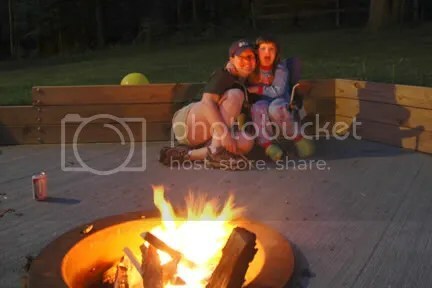 We have a camping resort that we go to and the kids love it! Swimming, riding bikes, camp fires and marshmallow and amazing memories as a family. But this summer, Rachel will be going away to camp for a whole week. During the Our Kids twitter party, I won a week at Muskoka Woods! She’s so excited to be going. And I’m very excited for her to be going. As I wrote previously, “I am me because of summer camp“! It’s very true. Camp gave me experiences and memories to last forever and I hope that this holds true for Rachel. Now we start the prep for summer camp. 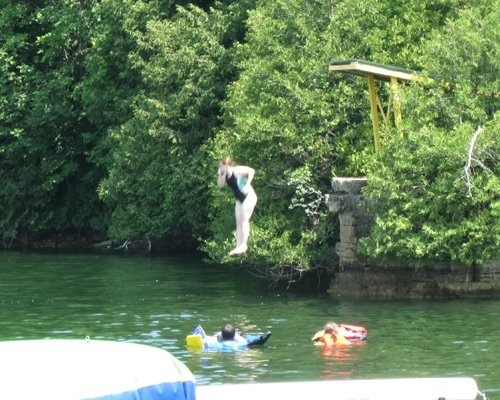 We’ll be going to the Muskoka Woods website together so that she can see the photos and videos. Plus they have lists of what to pack and how to prepare. Over the next few months, we’ll need to talk about how she feels about going away. I can’t just sit her down and make her talk; it will need to come up in conversation when she’s relaxed. I want to know if she scared or nervous, excited and happy. She could very well have all of those feelings. Getting ready for camp together, will allow us those times to chat about feeling and emotions. I’m sure I’ll be emotional too, but I need to be strong for her. The Our Kids site, has a great eBook “Preparing for Camp” and I know that it will have valuable information to guide me and Rachel through this process. As an Our Kids Ambasador, I’ll be sharing all our experiences with you over the next few months. If you have any questions that you want answered about picking a camp, or preparing for camp, please comment below and I’ll be sure to get the answers for you! Also, check out the other great ambassadors!! This Saturday at Roy Thomson Hall, you can find out about all sorts of camps for your children and family. I’m very excited to get to meet the great people from Muskoka Woods! 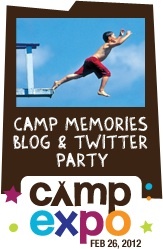 Last night at the #campexpo twitter party, we won a week at Muskoka Woods for Rachel for this summer! Now I have so many questions, and I know that at the Camp Expo there will be people who can answer those questions. • Learn about charities, discounts, bursaries and tax credits for camp.